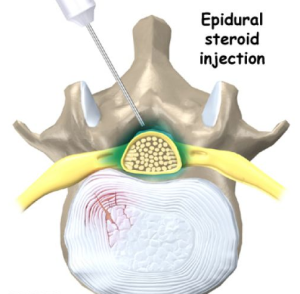 How do Steroid Injections Work for Sciatica Radiculopathy? When a person has a pinched nerve in the neck or the low back as a result of a disc herniation, the resulting pain may be burning, searing or disabling. Pain from a disc herniation in the neck may radiate and travel down the arm and is called radiculopathy. 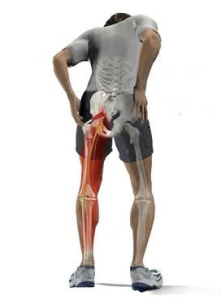 When it is a result of a lumbar disc herniation, it is termed sciatica. One of the best treatments that has been used for over 60 years now are steroid injections known as epidurals. Here is a quick overview of how the pain results from a pinched nerve. The disc experiences degeneration and experiences a tear in the outer part. Then this material from the inside part squeezes out and ends up compressing a nerve root. By itself, this is not that painful. However, the pinched nerve experiences considerable inflammation as a result of the compression. This leads to the sciatica or radiculopathy problem and is often extremely painful as it can feel like an electrical sensation going down the arm or leg. What the steroid medication does is act as a hefty anti-inflammatory medicine to knock out the flareup. In no way does the steroid medication fix the problem of the herniated disc. It simply acts as a Band-Aid to provide relief for weeks and months at a time by flooding the area with soothing anti-inflammatory medication. The human body knows that the piece of disc that has squeezed out is not supposed to be in the spinal canal pushing on the nerve root. It will usually slowly disintegrate the piece of disc, but in the meantime the steroid medication can be very helpful for Pain Relief. In those circumstances where the pain relief does not occur with injections, the person may end up requiring surgery due to continued pain. It may take a series of three steroid injections given a couple weeks apart to obtain the most pain relief possible. Injections can then be repeated every few months if necessary. For the most part, steroid injections are very low risk. There is a small risk of infection, bleeding and often times transient increases in blood sugar along with some temporary weight gain and water retention. The outcomes for steroid injections to relieve pinched nerve pain have been shown to be 75 to 90% satisfactory. It often allows individuals to avoid the need for spine surgery and to be able to get back to work and decrease the amount of narcotic medications necessary. If you are suffering from arm or leg pain due to a pinched nerve (or think that’s what it is), call the Nevada Pain Network. The Network offers pain management Las Vegas trusts, with pain clinics offering comprehensive treatment. Call (702) 323-0553 today to get connected!